Thinking out loud. Billet head with water jackets. I was pondering the other day about billet heads. I have also read many times on how proper water jackets are a key feature of a good working cylinder head. Obviously billet and good working (water cooled) cylinder head are rarely in the same sentence. I have seen two piece billet heads on snowmobiles. Noticeably, there are no ports or valves to deal with in this case. As a thought experiment, I wondered if you could build a 4 cycle head in layers. This is just thinking out loud here. I have a simple 3 axis CNC mill. I have profiled piston domes, combustion chambers, and simple projects of similar difficulty. A 3D printer basically builds the part one layer at a time. I make a lot of gadgets out of aluminum, usually scrap from the local surplus store. I make things like oil fill caps for valve covers. I find it easiest to “cheat”. I will make the threaded body and the top out of separate pieces, and then press them together. If the press fit is right, I don’t even weld them. Imagine a head that was “stacked” up in 2” layers. Combustion chamber depth would define the thinnest layer as you would never expect a lap joint to seal under combustion pressure. You could mill both, the chamber and water jackets as well as the runners with a 3 axis mill. Create some type of tongue and groove system for the two halves to mate and seal. Install the guides and seats after the head was permanently assembled. The head would have an interference fit on the layers. It would be pressed together and likely have a few bolts as a failsafe. The head bolts would also keep the layers together when bolted to the engine. Water leaks should be kept to a minimum assuming the tongue and groove system locked and sealed. Some stop leak would possibly help just in case. Like I said, I’m not looking to build heads, but…. Could it be done AND work? Re: Thinking out loud. Billet head with water jackets. The only time you hear about descrete components like that are old airplane engines and aircooled Porsche 911s. And note that in all of the above, they were AIR COOLED, meaning no coolant to seal, and they all had a reputation for not very good reliability. What you have described has been done over here with billet heads (with water jacket), as well as fully water jacketed billet blocks. dont dart weld two sections together? There was some manufacturer that made billet heads with the water jacket space milled down from inside the valve cover face. An intricate aluminum plate was welded in to cover the space and the rocker mounting features were then machined into this plate. The weld line was invisible after final machining. These were not the LS heads mentioned above. At a AETC conference ~ 20 years back, such a design was presented in prototype form, by Jim Feuling, AIR. It was ~4 layers thick, joined with adhesive I believe. I haven't heard of it since. Just curios as to what benefit billet head would provide over a cast head? Looking at this cut away maybe it could be done in 2 layers. The important place in a cylinder head to have water is around and near the exhaust valve seat and throat as well as the spark plug location. If that is provided and a path through an aluminum head is along its length close to the deck then the cylinder head can be kept pretty much somewhat evenly cooled. If that can be done with head horizontal sections and then the water jackets and ports sealed adequately then a billet aluminum head can be and has been constructed many times. This is probably a hit or miss target without the thermal imaging and testing equipment major engine manufacturers possess because if your best engineered guess is wrong or inadequate the obvious overheating that will occur will raise havoc with the proper operation and life of that head on a loaded running engine. The problem will be in sealing any split line that divides an exhaust port from the water passages. BTW, predicting cooling with CFD is part of ordinary workflow for cylinder-head casting design. I've thought about this many times over the years. My interest was more as a hobby project for myself to avoid the cost of the current top dog in 2.3 Ford heads - a $7000 casting from Esslinger. My idea was 2 pcs, a lower with the deck, chamber, bottom of the water jackets and the complete int/exh ports. Then an upper piece with the top of the water jackets and valve cover rails, etc. all sealed with a large o-ring and sandwiched together with the head studs.. I believe for high HP turbo stuff the water jacketing should have a high priority, this would allow good control over the water flow path. I'm pretty sure this would not be feasible for a production run but might be fun to pick away at on my antique machines at home. Flanders Racing - bringing you yesterday's technology today! You will blow past $7,000 like it was a Nebraska road sign on the way to making a viable billet head. Unless you need the superior materials to deal with very high combustion pressure most of the rest is will be worse than a casting. I'm not seeing how? A friend of mine with a mold making shop was looking into making us some billet blocks and the cost of materials was quite reasonable. Some stuff I'd have to farm out like the heat treat and valve seat work but my labor is free and Michigan winters are very long. Why don't you post some pics of this particular head if you can rustle some up. Just remember not to spend to much time frozen in front of that old bridgeport with a frozen piece of aluminum still clamped to the table. We won't be able to break you loose until spring for a burial! 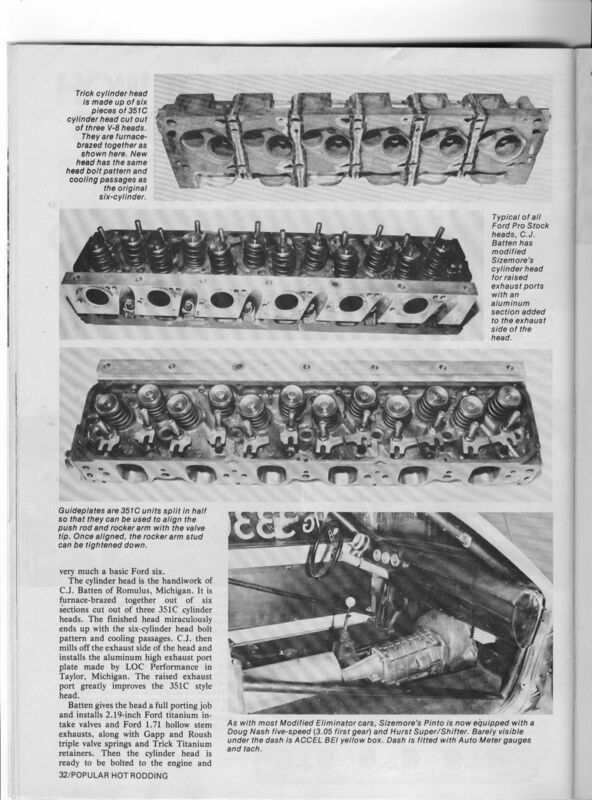 Is the 70's furnace brazing of 2 horizontally sectioned cylinder heads in Pro Stock was not uncommon to create tall ports. Also I-6 cylinder heads have been made by brazing sections of other better heads. With CNC technology I could see a layered and brazed cast iron construction being doable as a hobby project but not commercially viable - cast iron tooling stock is available. I'm also not sure that large scale furnace brazing is readily available anymore. There are also solders for aluminum but I'd be concerned about thermal stresses causing splits. There will be a long list of problems. With laminated pieces, you will have stability and sealing problems, if you are lucky, you might get one to work on attempt 5 or 10. On the exhaust port, by the time you have enough wall thickness to space the o-ring far enough away from the exhaust gas to live you will be so frustrated with the small space for the water passage that you will be yearning for the days of casting. Just look at a water core for a cylinderhead, there rarely are shapes that are convenient to planar lamination. The compromises that the water passages will have to make for planar lamination will be far from optimal from a cooling perspective. A block isn't at all comparable to the complexity of a head, a billet block is easy to make, a head, that actually cools well and seals,,,not so much. Several times, I have spent months on billet head designs (with very good CAD skills, the best software, experience with engine castings and a well equipped machine shop) and always come back to casting. I have not seen any practical advantage to it other than novelty except in cases of extreme cylinder pressure like nitro engines.